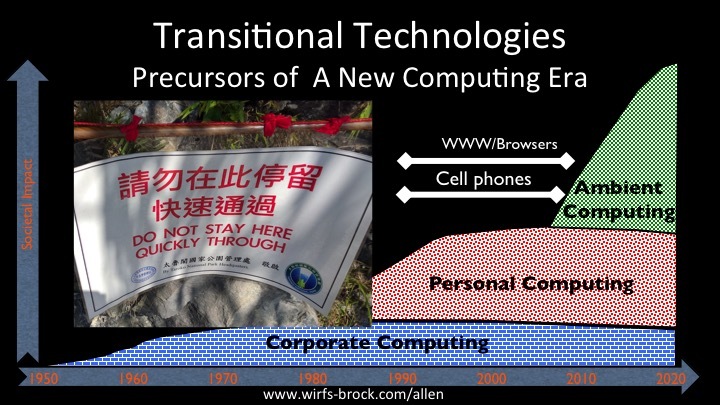 A transitional technology is a technology that emerges as a computing era settles into maturity and which is a precursor to the successor era. Transitional technologies are firmly rooted in the “old” era but also contain important elements of the “new” era. It’s easy to think that what we experience using transitional technologies is what the emerging era is going to be like. Not likely! Transitional technologies carry too much baggage from the waning era. For a new computing era to fully emerge we need to move “quickly through” the transition period and get on with the business of inventing the key technologies of the new era.